There has been a significant increase in flu activity in the UK and Europe in recent weeks, with several reports of severe illness in younger patients who have required admission to intensive care. There have also been several deaths. This increased activity is now being seen in Ireland. The predominant strain continues to be influenza A (H1N1). 1. Turn your head away from others. 2. Use a tissue to cover your nose and mouth. B) Dispose of the tissue afterwards in a waste bin. 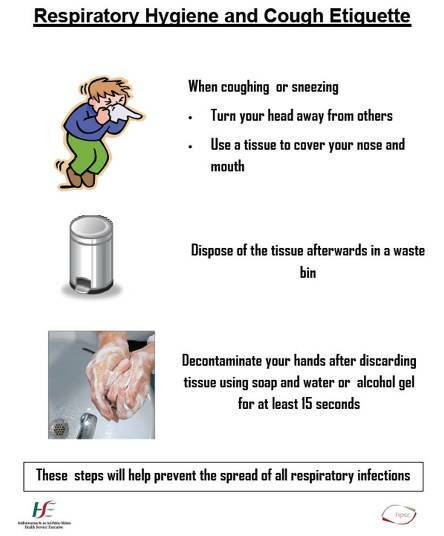 C) Decontaminate your hands after discarding the tissue. Use soap and water or alcohol gel for at least 15 seconds. If you get Influenza, please do not attend our Emergency Department. Stay at home and contact your GP and/or call the HSE information line 1850241850.